Thomas Bretz and Daniela Dorner, awarded for a technological breakthrough in astroparticle physics. - even during full moons. 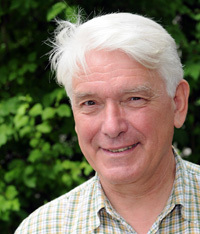 For their outstanding work in the field of experimental astroparticle physics, the German Physical Society (DPG) has awarded the Gustav Hertz Price 2015 to Thomas Bretz, now at RWTH Aachen, and Daniela Dorner of the University of Würzburg. 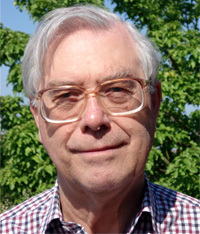 The DPG laudatio outlined their work on the improvement of Cherenkov telescopes as "an original and pioneering impulse" to astroparticle physics. Bretz and Dorner achieved this success within the German-Swiss project FACT (First Geiger-mode avalanche photodiode Cherenkov Telescope), in which also scientists from TU Dortmund, ETH Zurich and the University of Geneva participate. 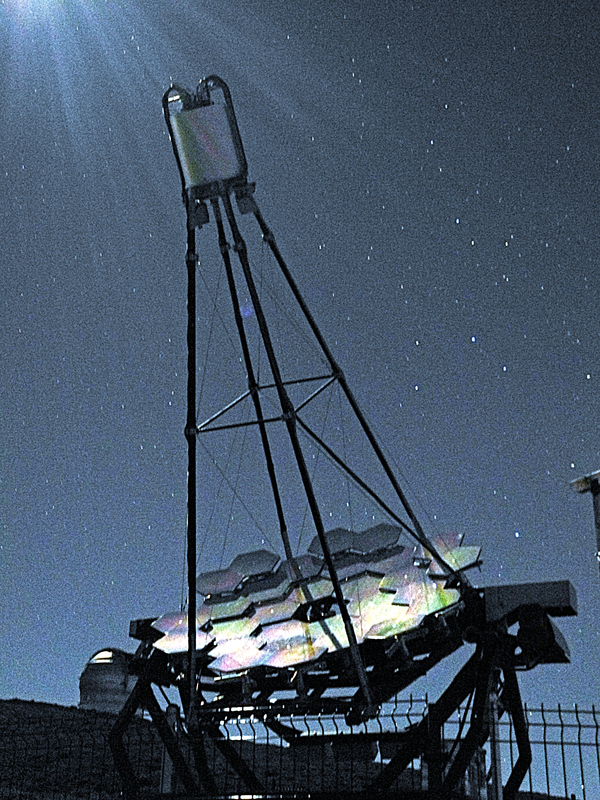 Cherenkov Telescopes for ground-based observations of cosmic gamma rays were so far based on single-photon detection using photomultiplier tubes (PMTs). The Cherenkov light from air showers triggered by cosmic rays entering in the Earth's atmosphere is recorded by the PMT cameras. Since PMTs show ageing when exposed to strong light and therefore must be turned off during bright moon phases, data gaps occur regularly in the observations. Continuous monitoring however is important especially for astronomical sources of variable brightness. Active galactic nuclei, for example, show extreme brightness fluctuations that are important for the understanding of physical processes in the vicinity of black holes. In order to make progress here, highly sensitive photosensors were necessary, combining low voltage power supply and nanosecond time resolution. The FACT collaboration developed for the first time a Cherenkov telescope with silicon-based photosensors, an idea primarly given by Eckart Lorenz from the Max Planck Institute for Physics in Munich. The camera has 1440 elements consisting of arrays of avalanche photodiodes in Geiger mode, the so-called Silicon photomultipliers (SiPMs), and a DRS4 readout electronics of the Paul Scherrer Institute. The camera was built at the ETH Zurich and installed in a telescope on the Canary Island of La Palma, in the observatory on Mt. Roque de los Muchachos, 2200 meters above sea level. With this camera, even observations during full moon are possible. Bretz succeeded to optimize the camera and trigger design to increase the sensitivity of the instrument compared to the PMTs used so far. Whereas the much higher data stream coming from this camera has been "tamed" by Dorner with databases. Meticulously they investigated the performance of the camera until they reached a high consistency of the data through a sophisticated feedback system. The two awardees agree: "It's a success of the whole collaboration that would not have been possible without the committed work of each collaborator." All Observations are controlled remotely, and the results are available in real time on a public website. This provides optimal conditions for the implementation of "Target of Opportunity" observations and multifrequency campaigns. The high quality of the data allows for pioneering approaches of automated data analysis, as currently developed at TU Dortmund. Originally intended as a joke by the two awardees, an idea became reality: Observations with the new system can be controlled via a smartphone interface. Bretz and Dorner managed to encapsulate and automatize the complex functionality of the FACT-technique like a Swiss Army knife. Thanks to FACT, SiPM cameras are now "proven technology", and they will be used in future large-scale facilities such as the Cherenkov Telescope Array (CTA). Maybe one day, the idea the two price winners had some years ago could be realised: A network of globally distributed Cherenkov telescopes that could compensate the data gaps resulting from the Earth's rotation. 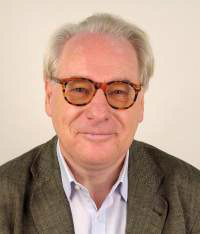 The Gustav-Herz-Price is endowed with 7500 euros and is awarded since 1993 for an outstanding, recently completed work from young physicists. The award was announced on November 27 and will be presented in March 2015 during the DPG annual meeting in Berlin. The AMS (Alpha Magnetic Spectrometer) detector on the international space station ISS. 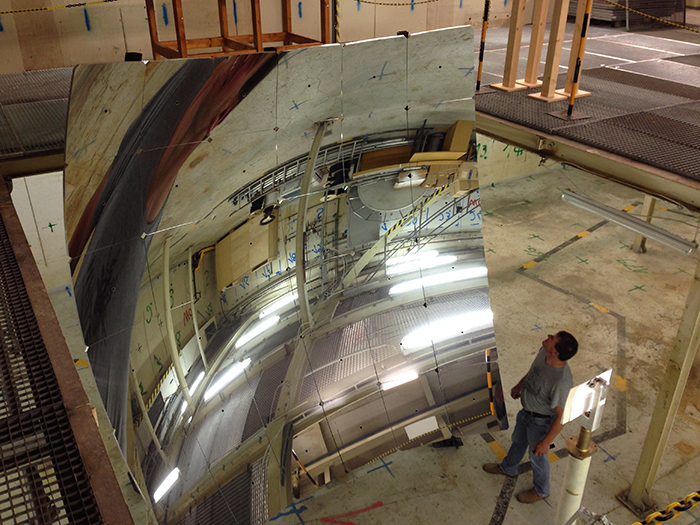 With this particle detector, scientists study the origin and nature of cosmic rays. 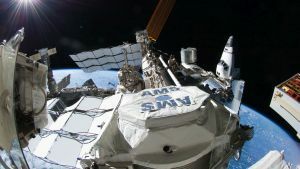 Latest results of the measurement of high-energy particles with the AMS detector on the international space station ISS provide for a deeper understanding of the origin and nature of cosmic rays. A young investigator group of Karlsruhe Institute of Technology (KIT), which is headed by Dr. Iris Gebauer, is involved in this experiment. It measured the sum flux of cosmic rays electrons and positrons. The spokesperson of the AMS project, Professor Samuel C. C. Ting, presented the results at the CERN Research Center last week. High-energy particles reaching the Earth supply important information about the universe. To determine the original composition and energy of these particles, they have to be measured with a detector outside of the atmosphere. This is done by the AMS (Alpha Magnetic Spectrometer) particle detector that was installed on the International Space Station ISS in May 2011. AMS was developed and constructed by more than 500 scientists from 16 countries. It consists of a track detector surrounded by an annular permanent magnet. Due to the magnetic field, charged particles passing the detector are forced to follow circular paths. From their curvature, the scientists can determine the electric charge and energy of the particles. Researchers of the KIT Institute of Experimental Nuclear Physics (IEKP) under the direction of Professor Wim de Boer participated in the development and construction of several components of the AMS detector. For data analysis, the KIT established the Young Investigator Group (YIG) “Cosmic Ray Transport Models for Dark Matter Searches with AMS-02” in 2011. This group is headed by Dr. Iris Gebauer. It coordinated the measurement of the total flux of electrons – negatively charged elementary particles – and positrons – antiparticles of the electrons of opposite charge -. The researchers also used the AMS particle detector to precisely measure the electron and positron flux. This means that they determined the intensities of electrons and positrons in cosmic rays. For the first time, the measurements quantitatively revealed how much electrons and positrons differ in energy dependence and flux intensity. In the range between 20 and 200 GeV, the rate of change of the positron flux was surprisingly higher than that of the electron flux. This shows that the excess of the positron fraction is due to a relative excess of high-energy positrons that are expected to result from dark matter collisions or pulsars and not to the relative loss or the relative decrease of high-energy electrons. These observations prove the fundamental difference between electrons and positrons, i.e. matter and antimatter. AMS measurement of the combined flux of electrons and positrons by the YIG of Dr. Iris Gebauer in cooperation with scientists of the Istituto Nazionale di Fisica Nucleare (INFN), Perugia/Italy, indicates the total intensity of both types of particles. “It is the most precise measurement of the electron and positron flux so far and determines the radiation flux up to energies of 1000 GeV with highest accuracy,” Gebauer reports. “Compared to the measurement of the positron flux, the energy range is doubled.” Now, the researchers can use a precision detector of 4 m in size to measure energy ranges in space that can also be accessed by large air shower experiments on the Earth’s surface. This is important for understanding cosmic rays and their sources. “Earlier experiments discovered structures in the total flux at 300 to 800 GeV, which indicated new physical effects. Our measurement shows that the total flux of electrons and positrons up to energies of 1000 GeV exhibits a smooth behavior that can be explained by an additional component of high-energy positrons,” the Head of the YIG explains. Future measurements with the AMS detector are planned to find out whether the observed excess of positrons really results from the existence of dark matter or from astrophysical point sources. For this purpose, the YIG scientists under the direction of Dr. Iris Gebauer measure the directional dependence of high-energy positrons. “Dark matter is widely distributed, a point source is located at a certain point,” Gebauer explains. The new results of the AMS experiment were published in the Physical Review Letters (113, 121102 – September 18, 2014). 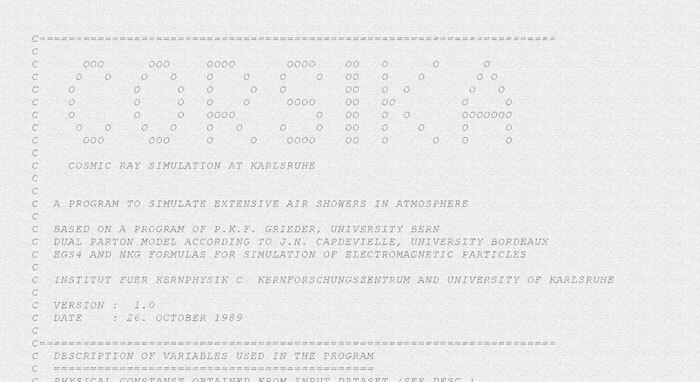 for her PhD thesis at RWTH Aachen. Every year, the "Deutsche Physikalische Gesellschaft" (DPG - German Society of Physics) distinguishes with the Hertha Sponer Prize young female physicists for their outstanding scientific work. In 2014 Dr. Anne Schukraft of RWTH Aachen received the distinction for her PhD thesis, which has delivered a significantly improved understanding of systematic errors and a significant increase in the experimental sensitivity of IceCube. IceCube is the largest neutrino telescope in the world, which captures traces of neutrinos from outer space at the South Pole. 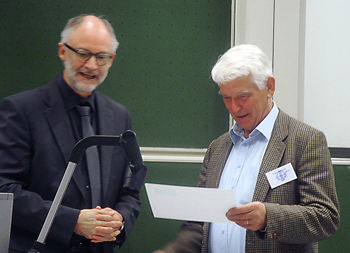 The prize was presented at a special ceremony of the German Society of Physics in Berlin. The Hertha Sponer Prize is name so in honor of the great German physicist Hertha Sponer (1895 – 1968), who in 1920 was one of the first German women to receive a PhD in physics. The prize consists of a prize of 3 000 euros and is primarily intended to support young scientists and to attract more women in physics. Unfortunately Prof. Dr. Völk could not make it to the ceremony. 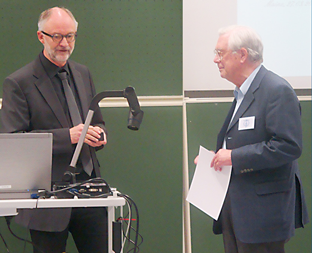 The ceremony took place at the beginning of the Member Meeting of the 'Fachverband Teilchenphysik' of DPG at the Johannes Gutenberg University Mainz on 2014, March 27. The three retired scientists are awarded a Senior Fellowship, travel funds for conferences and schools associated with HAP as well as funding opportunities for scientific projects. Thus, the recognized scientists can continue to be involved in current research and to share their experience and knowledge within the Alliance. The three Senior Fellows 2013: Franz von Feilitzsch, Gerd Schatz and Heinrich J. Völk. at the beginning of the Member Meeting of the 'Fachverband Teilchenphysik' of the DPG. We cordially invite you to attend! 13/01/14 - What pulls the Milky Way through space? The universe at a distance of up to a billion light-years from Earth. The Shapley Supercluster is to the right of the Milky Way. The Local Group of which our Milky Way is a part, travels with about two million kilometers per hour through space. Scientists are still debating the cause of this cosmic frenzy. An international collaboration of researchers from the US, France, Australia and China and the University of Bonn finds evidence that the giant Shapley Supercluster can not be solely responsible but that there should be another huge gravitational attractor further out, bringing the Local Group up to speed. The Local Group is a group of galaxies that includes the Andromeda Galaxy, the Triangulum Galaxy ( M33 ), other smaller galaxies as well as the Milky Way. "The reason for the high speed and the cause of the direction of their movements are not explained conclusively so far," says Marek Kowalski of the University of Bonn. The research team has followed a new approach to better understand the sources for the motion of the Local Group. Within the framework of the Nearby Supernova Factory project, the research team took more than 100 observations of Supernovae of type Ia with the 2.2-meter telescope of the University of Hawaii on the summit of the Mauna Kea volcano. The researchers used it as a kind of lighthouses in space: "On the basis of their brightness, we can determine the distance to the supernovae and the speed with which they move away or towards us," explains Marek Kowalski. Like an onion, the researchers divided the sky of the Earth in individual spherical shells. Depending of the supernovae that lied in each shell, they determined the speed and the direction of movement of these subspaces. "Our hypothesis was that the attraction of a gigantic mass is the cause of the motion of the Local Group and the shells", says Ulrich Feindt, a PhD student of Kowalski and first author of the study. In the predominant direction in which the Local Group hurtles thourgh the Universe stands the Shapley Supercluster (SCI 124), the largest concentration of galaxies in our nearby universe at a distance of 650 million light years to the Milky Way. "Our data showed, however, that the gravity of the Shapley supercluster is not sufficient to explain the velocity of the Local Group as well as the profile of our shells," says Feindt. "We would have to add a second object of approximately the same mass to obtain the required attraction." The scientists suspect that this enigmatic gigantic mass could be a loose collection of different galaxies, the so-called Sloan Great Wall. The gravitational attraction of this agglomeration of Galaxies together with that of the Shapley Supercluster could explain the speed and the direction of motion of the Local Group according to the findings of the researchers. This study is the most comprehensive one on the subject. 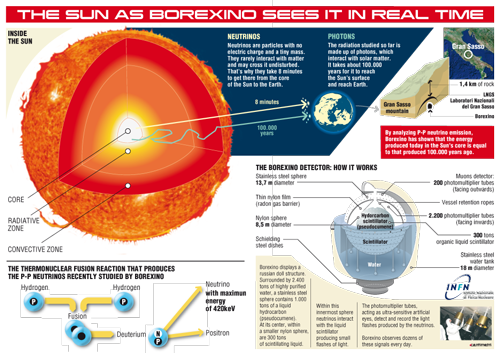 The international collaboration of researchers used Supernova data, which extends about twice as far as that of previous work on the subject and hence enabled the new findings.